Sai Foundation offers 3 BHK apartment available for sale in Karapakkam,Chennai developed with world class fittings. Vaikund Estates offers 2 bhk apartment available for sale in Karapakkam,Chennai designed to offer a scenic view of its natural surroundings. Vaikund Estates presents 2 bhk apartment available for sale in Karapakkam,Chennai developed with new construction methods and facilities. Altis Properties presents 2 BHK Apartments in ECR, Chennai developed with ample infrastructure and holds essential amenities as per the customer expectations. Casagrand Builder Private Limited offers 2 bHK flats for sale in ECR developed with all essential facilities. Nahar Foundations Pvt Ltd presents 2 bhk residential flats available for sale in ECR encompassing all the benefits to offer inclusive growth to the potential customers at affordable price. 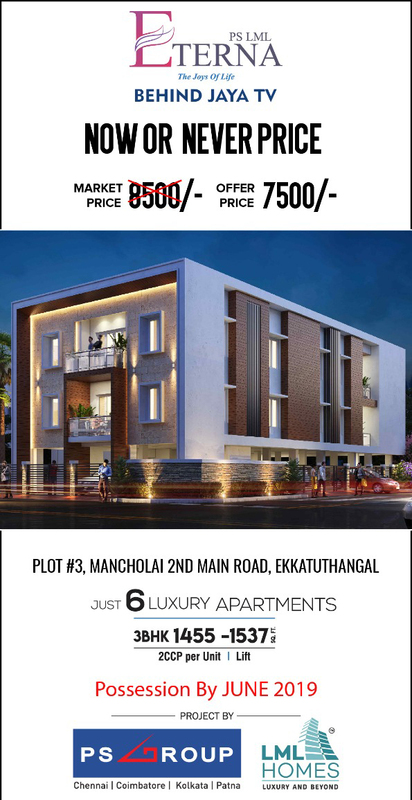 Ramaniyam Real Estates Pvt Ltd offers 1 BHK Residential Apartment located at Sholinganallur at affordable price point.